Shell strikes an open area, with no injuries or damage; security sources say it is likely Syria spillover. 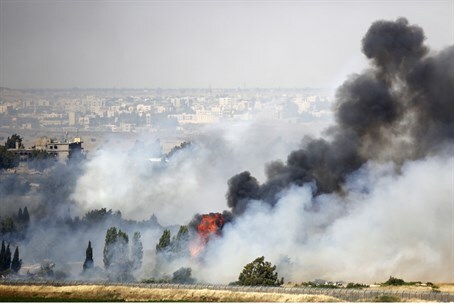 A mortar shell struck the Golan Heights on Wednesday night, near Alonei HaBashan. The shell struck an open field and there were no casualties. Security officials said shortly after the strike that the shell was likely accidental spillover from nearby Syria. Tensions along the border enflamed in January, after Major Yochai Kalengal and Sgt. Dor Chaim Nini were killed after Hezbollah terrorists shot between 4-6 antitank missiles into Israel, near Har Dov in the Golan Heights. The attack also injured six additional soldiers, and a Spanish UNIFIL peacekeeper was killed in retaliatory fire from Israel.